Muni posted the bus line's termination notice and its last day of service will be Friday, August 14, 2009. San Francisco Muni CultureBus, also known by its nickname "74X," and soon later "fail whale" and "tax waste." Born September 20, 2008 and died August 15, 2009. SFMTA officials predicted the bus line would obtain 168,000 to 250,000 passengers per year with an average 20-30 boardings per vehicle and running on a 20 minute frequency. It was estimated the City and County of San Francisco and SFMTA would spend $1.6 million on the experiment. The light was shining for the 74X thanks to an article from the San Francisco Chronicle, but its extremely high $7 adult fare (now $10), very low ridership, and criticism from the local blogging community started the slow death of the bus line. Tour bus agencies argued that tax dollars should not be used to undercut the tourism industry and their vengeance also took its toll on the yellow colored bus. Not long later, SFMTA scaled back the failing service on January 24, 2009 from 20 minute frequencies to hourly service, and from six buses to two. Still, with very low ridership, it was eventually going to be terminated by the agency due to the large financial deficit for the next fiscal year. 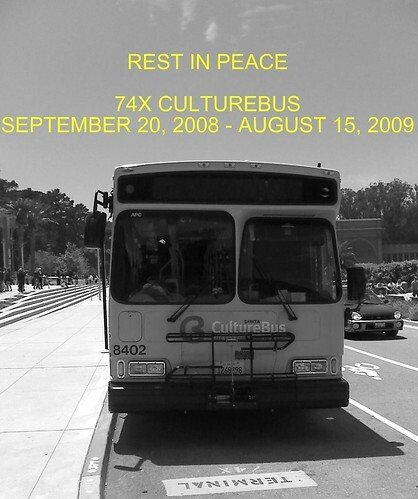 On August 15, 2009 Culturebus died while the 5-Fulton, 44- O'Shaughnessy, N-Judah, and 71-Haight/Noriega, easily overshadowed the 74X and provided service to visitors and citizens alike for 80% less than what the CultureBus charged. Gavin Newsom and Nat Ford's experiment died a horrible death and at the expense of taxpayer money. That just shows you how much the overpaid folks at MTA know. Their projections about the number of people who would ride the culture bus were pure fantasy. Similarly, MTA is getting ready to implement the Bicycle Plan, which will screw up traffic for everyone but cyclists. It will also screw delay Muni lines on a number of streets, including Masonic, Second Street, Fifth Street, and Cesar Chavez.